I’m pleased to be able to announce that WEASELS RIPPED MY FLESH! 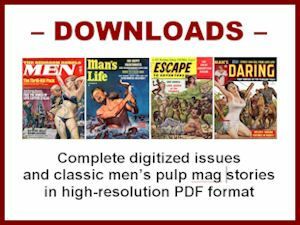 — the world’s first modern anthology of vintage men’s pulp adventure magazine stories — is now available on Amazon.com. It was officially released this week by New Texture, the indie publishing company headed by writer, photographer and graphic designer Wyatt Doyle. The 436-page print edition will soon be followed by an eBook version. Both will eventually be available through other major online book outlets. The WEASELS RIPPED MY FLESH! anthology is an outgrowth of this blog. 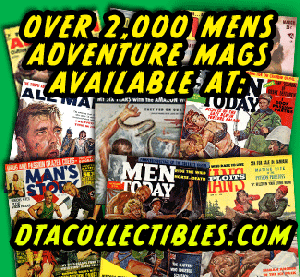 It features 22 wild stories originally published in various men’s adventure mags in the 1950s, 1960s and 1970s, including MALE, REAL MEN, TRUE MEN STORIES, UNTAMED, EXOTIC ADVENTURES, SIR!, FOR MEN ONLY, GUSTO, MAN’S STORY, ESCAPE TO ADVENTURE and others. Among them are early “lost” stories by the acclaimed mystery novelist Lawrence Block, legendary science fiction writers Harlan Ellison and Robert Silverberg, award-winning novelist and playwright Bruce Jay Friedman, top military aviation historian Robert F. Dorr, action/adventure novelist Walter Wager, the once world-famous adventure travel journalist and pinup model “Jungle Jane” Dolinger, and a writer who was a favorite of the great Atlas/Diamond men’s adventure magazines published by Martin Goodman’s Magazine Management companies — Walter Kaylin. 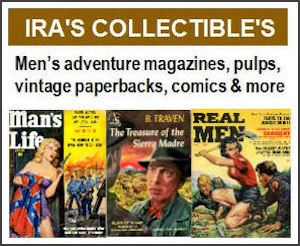 The book also features some of my favorite classic adventure yarns and “sexposés” written by other lesser-known and unknown pulp writers. 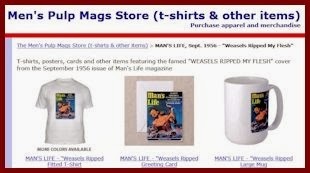 One is the actual story “Weasels Ripped My Flesh,” from the September 1956 of MAN’S LIFE (which is indeed a yarn about a horde of bloodthirsty, flesh-ripping killer weasels). That was the story that inspired the title of the 1970 album by Frank Zappa and his band The Mothers of Invention. Zappa’s use made it the most famous phrase to come from the men’s adventure magazine genre (though many people who aren’t steeped in Frank Zappa lore mistakenly think he coined it). The cover of the MAN’S LIFE issue it appeared in, featuring an iconic animal attack painting by the great Wil Hulsey, is probably the best-known men’s pulp mag cover in the world. Connecting the dots between Zappa’s album and the MAN’S LIFE story also inspired me to create the MensPulpMags.com blog. That led me to pursue publication of an anthology collecting such tales. Thus, as I pondered a possible title for the book, WEASELS RIPPED MY FLESH! was the obvious choice. And, the cover of the September 1956 of MAN’S LIFE was the natural pick for the graphic on the front. When I talked to the well-known authors whose stories appear in the book about reprint rights, I was pleasantly surprised by their warm response. They were all very gracious to me, and I’m honored by and grateful for their participation. I’m also very happy to have writer/musician Josh Alan Friedman and New Texture’s honcho Wyatt Doyle as co-editors. In addition to providing colorful commentary, Josh contributed reprints of his fascinating interviews with the late Mario Puzo and Walter Wager, both of whom wrote many stories for men’s adventure magazines before becoming famous novelists. Wyatt Doyle worked with me to pick the final selection of stories in the book, wrote and edited various intros, and did an amazing design job on the book’s heavily-illustrated layout. The website for the WEASELS RIPPED MY FLESH! book includes a 40-page preview, the table of contents and bios of the featured authors. So, if you want to know more, start there. Also, thanks to Wyatt Doyle’s own significant other, Sandee Curry for proofreading and other valuable help she provided. 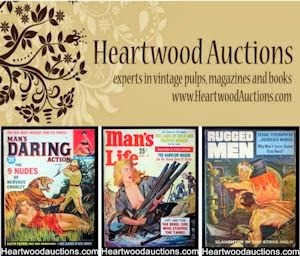 Thanks to my friend Rich Oberg, the world’s foremost expert on men’s adventure artwork and magazines, for sharing his knowledge and collection with me. And, finally, thanks to the readers of this blog and the many knowledgeable and talented people from all over the world who are members of the Men’s Adventure Magazines Facebook group for your encouragement and support for the WEASELS RIPPED MY FLESH! book project.